12 v Queens Park Rangers, - 2 covers. 13 v Chelsea, - postponed, original programme + insert used for re-arranged fixture. 32 v Southampton, - 2 covers. 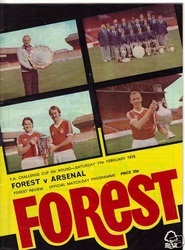 33 v Manchester City, - 2 covers. 34 v Mansfield Town (County Cup Final) - single sheet. 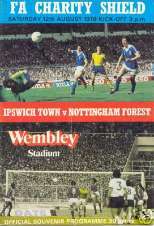 (1) v Ipswich Town (at Wembley, Charity Shield), 12/8/78. 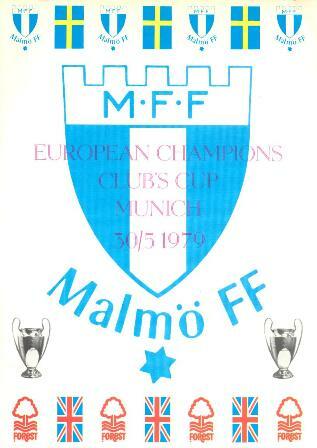 (2) v Vigo Tournament (games v Celta Vigo, 14/8/78 & FC Porto, 16/8/78). (3) v Coventry City, 22/8/78. (4) v Queens Park Rangers, 26/8/78. (5) v Oldham Athletic (League Cup 2), 29/8/78. 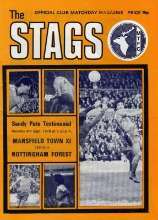 (6) v Mansfield Town (Sandy Pate Testimonial), 4/9/78. 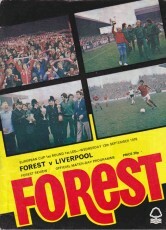 (7) v Manchester United, 16/9/78. 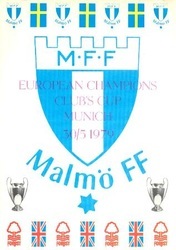 (8) v Liverpool (European Cup 1-2), 27/9/78. (9) v Aston Villa, 30/9/78. 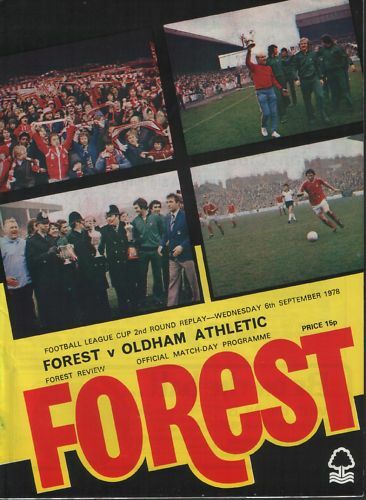 (10) v Oxford United (League Cup 3), 4/10/78. 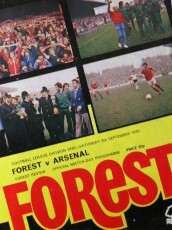 (11) v Bristol City, 14/10/78. 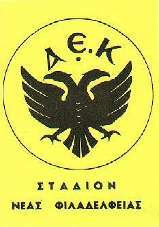 (12) v AEK Athens (European Cup 2-1), 18/10/78. (14) v Everton (League Cup 4), 7/11/78. (15) v Tottenham Hotspur, 11/11/78. 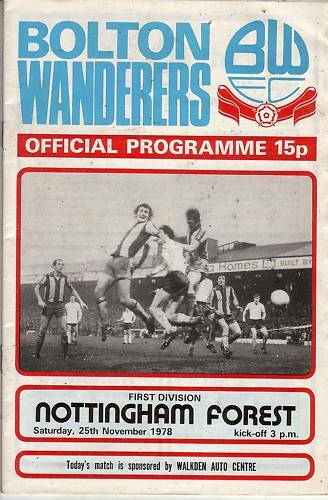 (16) v Bolton Wanderers, 25/11/78. 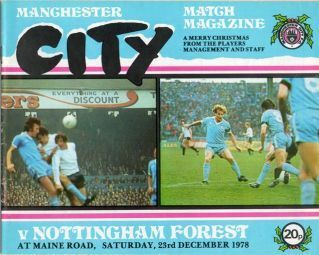 (18) v Manchester City, 23/12/78. 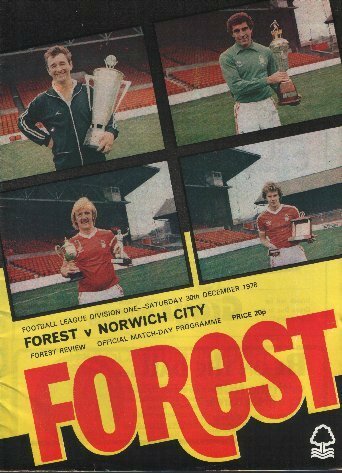 (19) v Leeds United, 1/1/79 - postponed. 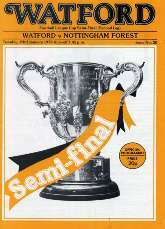 (21) v Watford (League Cup Semi-final 2), 30/1/79. (23) v Exeter City (Nick Jennings Testimonial), 19/2/79. 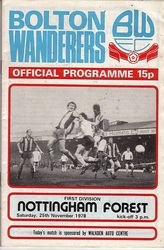 (24) v West Bromwich Albion (at Witney Town, Trevor Stokes Testimonial), 21/2/79. 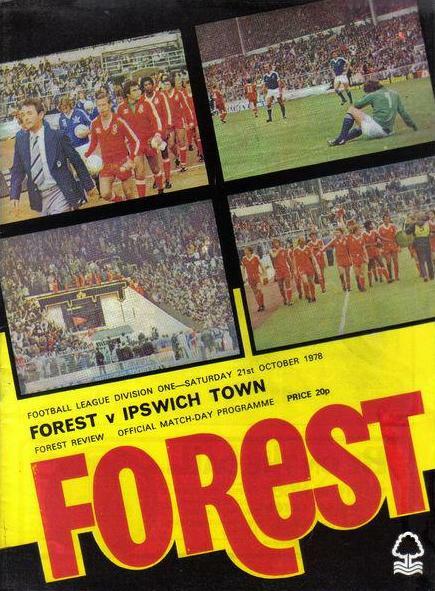 (25) v Ipswich Town, 3/3/79. 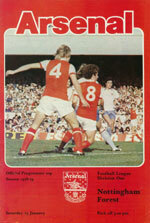 (27) v Southampton (at Wembley, League Cup Final), 17/3/79. 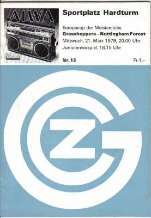 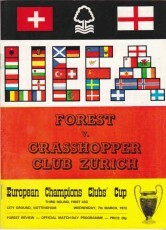 (28) v Grasshopper Zurich (European Cup QF 2), 21/3/79. (30) v Derby County, 14/4/79. 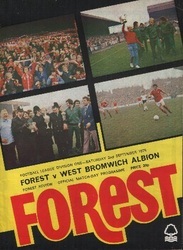 (31) v Birmingham City, 21/4/79. 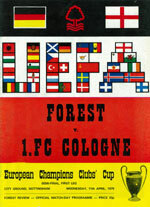 (32) v FC Cologne (European Cup Semi-final 2), 25/4/79. (33) v Wolverhampton Wanderers, 30/4/79. (34) v Norwich City, 5/5/79. 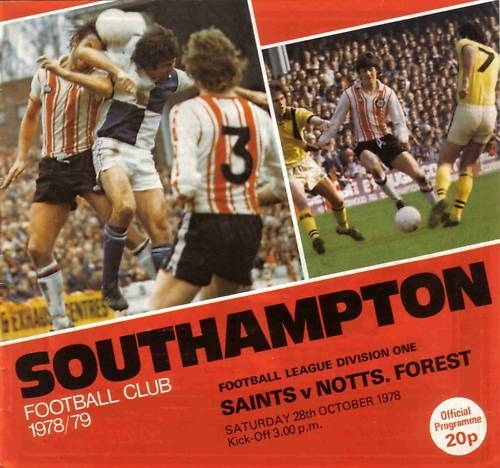 (35) v Southampton (Lawrie McMenemy Testimonial), 11/5/79. (36) v Leeds United, 15/5/79. 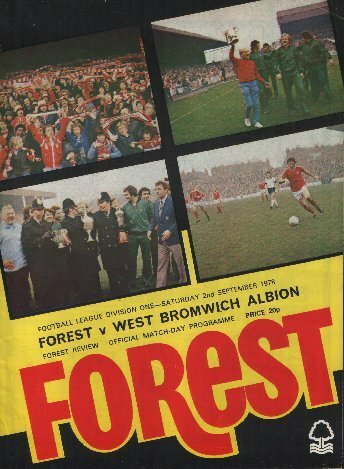 (37) v West Bromwich Albion, 18/5/79. 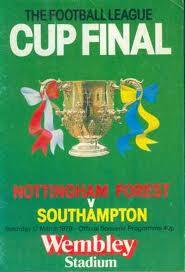 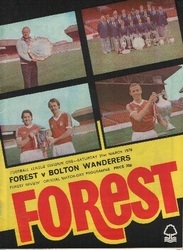 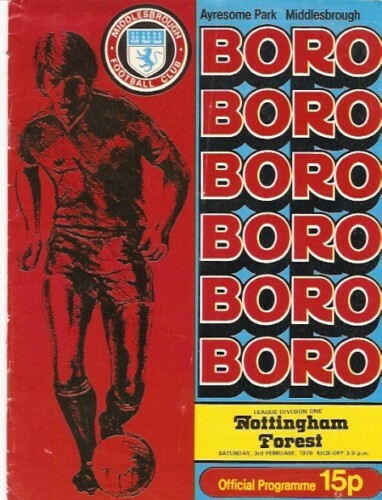 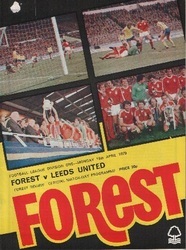 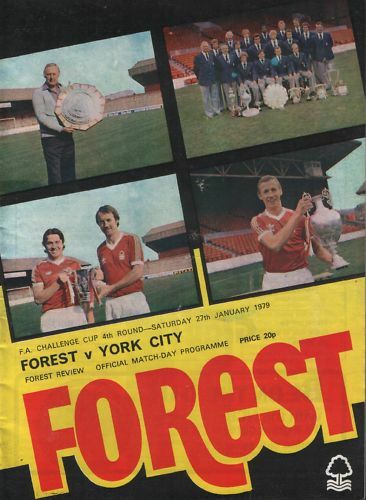 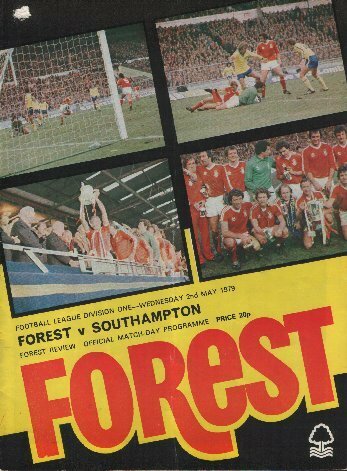 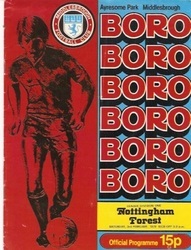 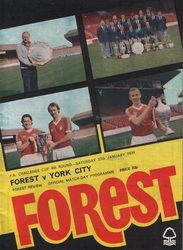 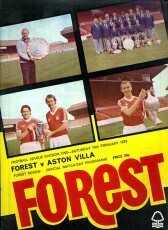 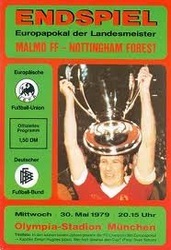 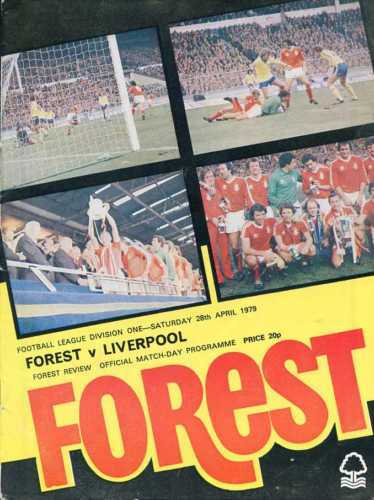 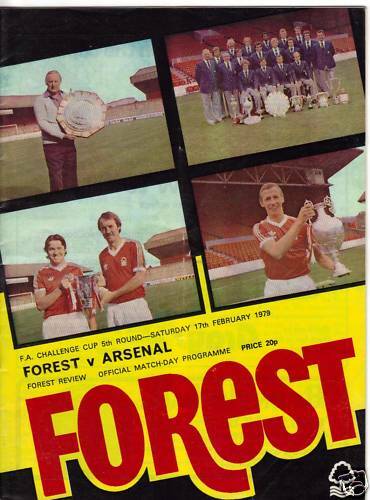 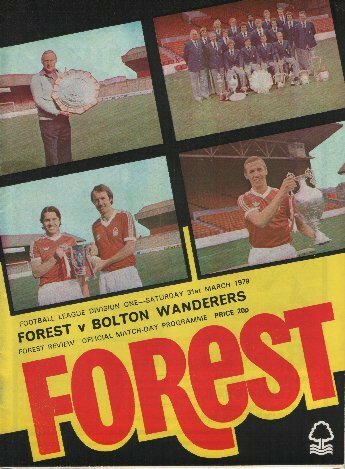 (38) v Malmo (in Munich, European Cup Final), 30/5/79- 2 covers + Malmo & Nottingham Forest Editions. 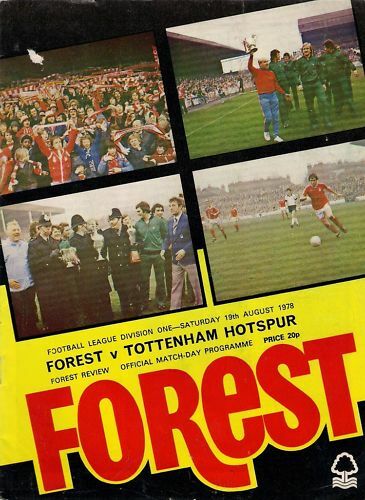 (1) Red Star Belgrade (Yugoslavia) v Nottingham Forest (pre-season friendly), 25/7/78. (2) Dynamo Zagreb (Yugoslavia) v Nottingham Forest (pre-season friendly), 27/7/78. (3) SK Osijek (Yugoslavia) v Nottingham Forest (pre-season friendly), 30/7/78. 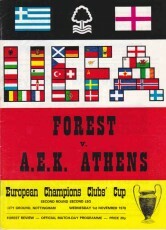 (4) AEK Athens (Greece) v Nottingham Forest (pre-season friendly), 2/8/78.